Chumash Casino, Santa Ynez, California – Undefeated cruiserweight warrior Lateef Kayode (17-0, 14 KOs) won a one-sided twelve round unanimous decision over Matt “Too Smooth” Godfrey (20-3, 14 KOs) on Friday night at the Chumash Resort Casino. 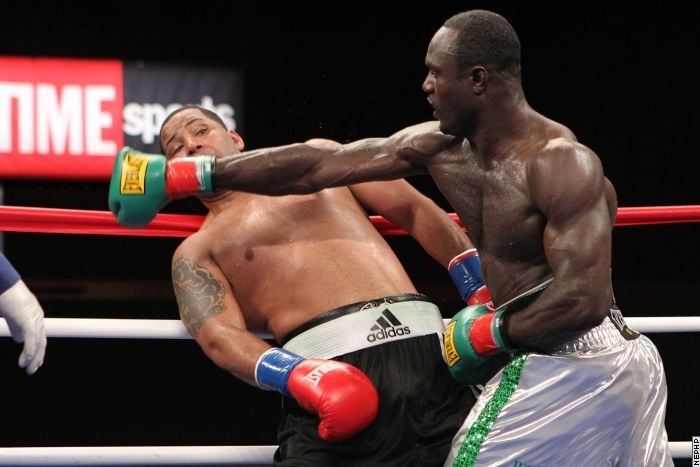 Kayode easily controlled the whole fight and floored Godfrey down for the count three times. He dropped Godfrey in rounds one, five and nine with some devastating punches to the body and to the head. Scores were 98-90, 97-90 and 98-89. “I thought we would finish Godfey off earlier, but he took some good shots. It’s OK we went the distance. Kayode needs rounds. Overall I thought it was a good performance.” said Freddie Roach. In the co-feature, Chris Avalos (19-1, 15 KOs) won an unanimous decision over previously-undefeated Khabir Suleymanov (11-1, 5 KOs). Scores were 95-92, 96-91 and 97-90. In other bout, Art “Lionheart” Hovhannisyan (14-0, 8 KOs) scored a six round stoppage of Ray Marquez (11-1, 7 KOs). The fight was waved off when Hovhannisyan dropped Marquez a spectacular left hook. Time was 1:03. “I was just very confident I would win this fight. He’s good and he has speed but I never thought I’d lose. He’s undefeated but so am I. I’m ready now for any fight. I’m ready for anyone.”said Hovhannisyan.